I wish Better Homes & Gardens would reprint their 1960s Dessert Cook Book. This old hardback is a gem, and I make family desserts from it all the time. If you want a copy of your own, make sure you’re getting one from the 1960s. It went through several printings, so you should be able to find a copy. But don’t order one from the 1970s, by then they’d dropped their best recipes to support the Jell-O craze and the flood of women heading out into the workforce. My kitchen was such a mess that day. Obviously it wasn’t just pie that created mass destruction, but I found myself paralyzed by the mountain of dish washing ahead of me. Luckily, Dishboy Scott came to the rescue! Thanks Dishboy, you’re the best, even if you’re just in it for free pie and martinis. Due to short, unorganized, old time style instructions, failure to read this recipe before starting could possibly result in frustrated yelling and self hair pulling as you scramble to catch up. I have clumps of missing hair to prove it. Cover bottom of cooled pastry shell with nuts. Fill with chilled Cream Filling. Halve two cups of the strawberries. Pile atop filling. Glaze: Crush remaining ½ cup berries; add water; cook 2 minutes; sieve. Mix sugar and cornstarch: gradually stir in berry juice. Cook, and stir until thick and clear. Tint to desired color with food coloring. Cool slightly; pour over halved strawberries. Keep refrigerated till serving time. Pass whipped cream, if desired. Really? I thought it was for Date Pinwheels 30 pages away. Sorry, the sarcasm seems to be oozing out of me today. I think I need a piece of pie. Mix first 4 ingredients. Gradually stir in milk. Stirring constantly, bring to a boil; reduce heat and stir until thick. Stir a little of the hot mixture into egg; return to remaining hot mixture. Bring just to boiling, stirring constantly. Cool, then chill. (It will be very gelatinous after chilling.) Beat well; fold in whipped cream and vanilla. Recipe from p77 of the "Better Homes & Gardens Dessert Cook Book", published 1960. Pictures by Laura Flowers. 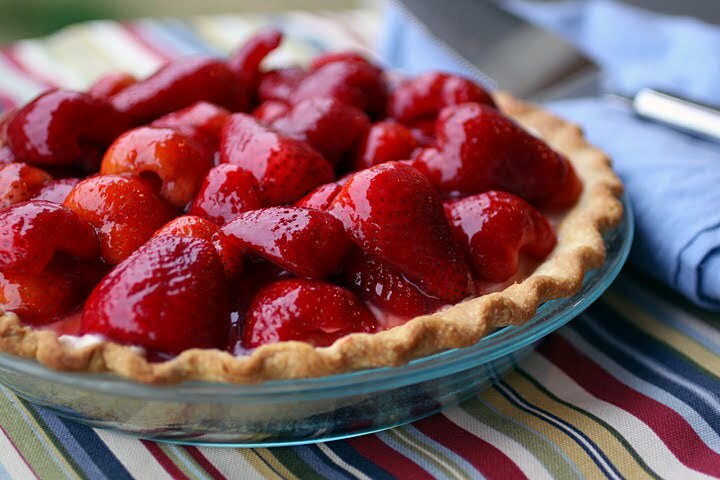 Hi Laura, these strawberries look so yummy, well the whole pie looks good. 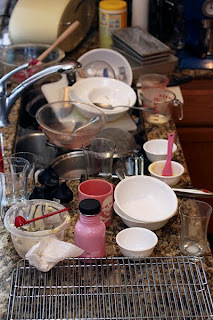 I love to see your kitchen mess, like you said, it's very neat compare like mine when I am in baking rush. I hope you have a wonderful Easter, I can't wait to see all the yummies you are going to make. Oh my gosh Laura, this pie really is gorgeous. If I don't "talk" to you have a great Easter! yum, this looks absolutely delicious! I might try this for Easter. ciao Laura!!! sono irresistibili!! complimenti! Looks scrumptious and I agree about the food coloring. I have that same recipe called "Strawberry Satin Pie" in a BT&G volume 1 Encyclopedia of Cooking -from the early 1970s! Still a winner as your photos attest. This pie looks absolutely stunning. I have some strawberries right now! I don't see any hair in that pie so that is a huge relief - I would have gagged. But I, too often fail to read the full recipe which results in some unfortunate eating adventures or last minute dashes to the store. After reading the comments- well I have to stop, laugh, then be glad there is none of my hair in the pie...uh oh, oh me oh my, what a beautiful pie! Okay Laura, I am MOST definitely making this for Easter! I have made fresh strawberry pie, but never with cream filling...puts it in another sphere:) You can't really see it, so it's kind of a surprise when you dig in! (BTW, go back to the giveaway and post a second comment that you are a follower and that will give you two spots, a second chance!) I'm using random.org :) Thanks for your kind comments! I just had a pie very similar with the custard on the bottom. I have made the regular fresh strawberry pie I used to get at Bakers Square but that looks good. THanks for sharing. Very similar to a French Tart recipe I was perusing recently. I love your additional photos, and now I know you were in my kitchen again... not only did you take a picture of my counters, you captured my cabinets too! PS - next time, leave me a piece of pie please. Oh girl, you made those berries sing... what a great picture and the recipe sounds like fun too! We are all helping out the poor suffering strawberry growers, let's keep those berries in the stores and not in the dump!! Oh heck yeah! This is a perfect spring and summer dessert. Looks gorgeous and refreshing. I'll have to keep an eye out for one of those 1960 books. LOVELY pie! I love cookbooks like that. I page through the old Betty Crocker cookbook that my grandmother gave me all the time. Thanks V! Wow even when I'm copying something I add an incorrect suffix lol! Where have you been my friend? Anyway, yeah use any nuts you want. Pecans would work well. Oh dear, one look at that pie and my drool-glands went into overdrive. I blame you completely if I walk out of the house and realise there is slobber on my collar. that looks ridiculously good! i haven't made a pie yet, but you got me thinking about what kind of pie to make! Absolutely stunning. Beautiful and mouth-watering!! It's so shiny. Like a garnet pie! i'm wordless on front of the picture of the tart... it's so beautiful! Thank-you for the comments everyone! I love comments. sounds divine, think i will put some rose water in the cream! For free pies and martinis, I would gladly wash your dishes anyday. Your strawberry pie looks delightful. I love fruit pies and this one hits the spot. Your pictures are beautiful and inspiring – I could definitely see myself making this pie! I will be looking out for this book in the thrift stores. Your pie looks amazing. Really. AMAZING! Oh yum! My mum used to make a wonderful pie a bit like this, I must dig up her recipe. Oooh, that pie looks so beautiful and delicious! I think I may forego baking a birthday cake in favour of this! Absolutely mouthwatering pie! I'm so excited about all the fruits and vegetables coming into season now or soon. What a fine sounding fate for strawberries. Bookmarking this one, for when the season strikes. Thx! I just made the pie for Easter and it was AMAZING! It was much simpler than I thought and I got rave reviews from my family. I was a bit worried once my cream filling chilled because it turned into a bizarre gelatinous texture. But I just whipped it a lot and it turned much creamier. Did this happen for you too? Maybe I am using the wrong milk or something? You did it perfectly. It's very gelatinous after chilling and before beating and folding in whipped cream. I think to hold up all those strawberries. I used to have this cookbook, but it disappeared. I have lamented it for a long time. Thanks so much for posting this recipe, which I've made long ago and now I can make it again. Lovely, lovely-- then again, you are a professional photographer and that's why I love your blog. this sounds so great! i love finding vintage cookbooks and finding the greatest recipes in them! i'll be on the lookout for this one! Gorgeous! Oh, how I would love to have a slice!! I hope your pie turned out well! I think by now I have successfully stolen every single cookbook from my mom's cupboard including all those publicity recipe pamphlets from the 60's and 70'. I mean, she doesn't cook, does she? And I love the recipes! This is a great pie and now that strawberries are starting to show their pretty little faces at the market... MMMM. By "very gelatinous," do you mean "almost as firm as a tapioca ball"? I am partway through making this and my cream filling (before folding in the whipped cream) is pretty dang solid (does not drip off fork, even after being beaten). Should I abort and start over? Don't start over! I know it's crazy, but that's exactly how it's supposed to be. Thank you so much for responding so quickly! I had to interrupt my pie-making to take someone to the airport, so I can still move forward with my first batch...you've saved me! Thanks again. (This looks marvelous, by the way; the perfect use for the millions of strawberries I picked yesterday!). Oh good! I'm so glad. I had the same response too and almost freaked out making it! Does anyone know if it's ok to make this pie a day prior to serving? I think that should be just fine as long as you don't cut into it. The filling is pretty thick and the strawberries are protected by the glaze. Ok, thanks for the info, sounds like it will be ok. I'd really rather make it the day of, but not sure how long it will take. 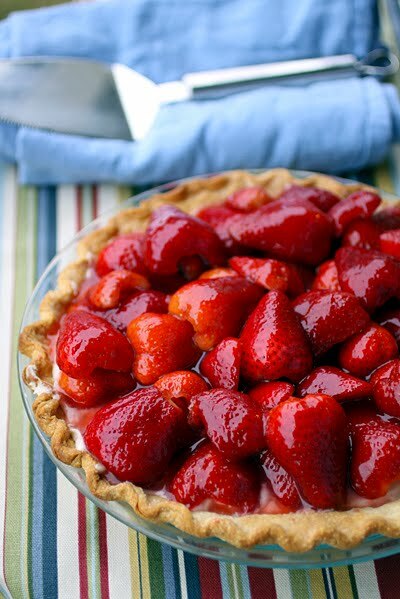 I've already got the pie shell baked and cleaned the strawberries. Hmmm. I decided to make it the day of, which was today. It turned out great, looked beautiful and tasted fab. The only issue I had was that the filling spreads a bit once you cut the pieces, so they were a bit messy on the plates. Thanks so much Laura for sharing this one. Well worth the effort. I just caught my husband licking his plate. Anne I am so glad! Thank-you for telling me. I think that you can make it a day ahead next time and it will be fine. I know I make mine at least 12 hours ahead so it firms up, so another 12 hours would likely not hurt it at all.